It's kinda strange how some rides come together. 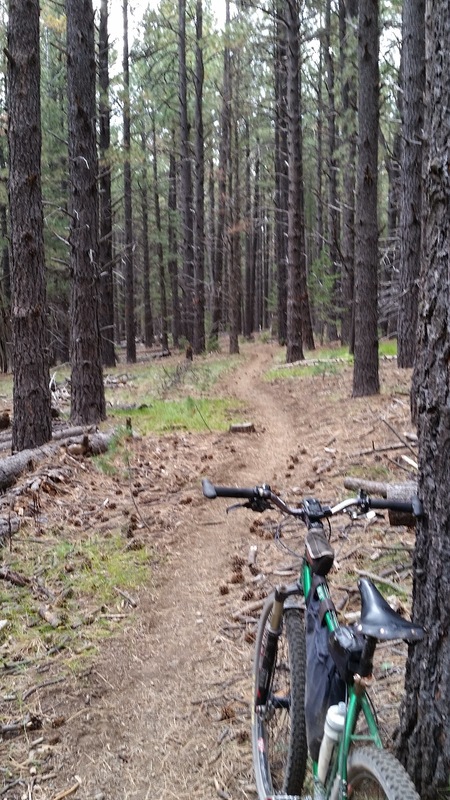 Somehow the entire summer has almost slipped away and I had yet to put tires on the prime dirt of Flagstaff. How could this be? 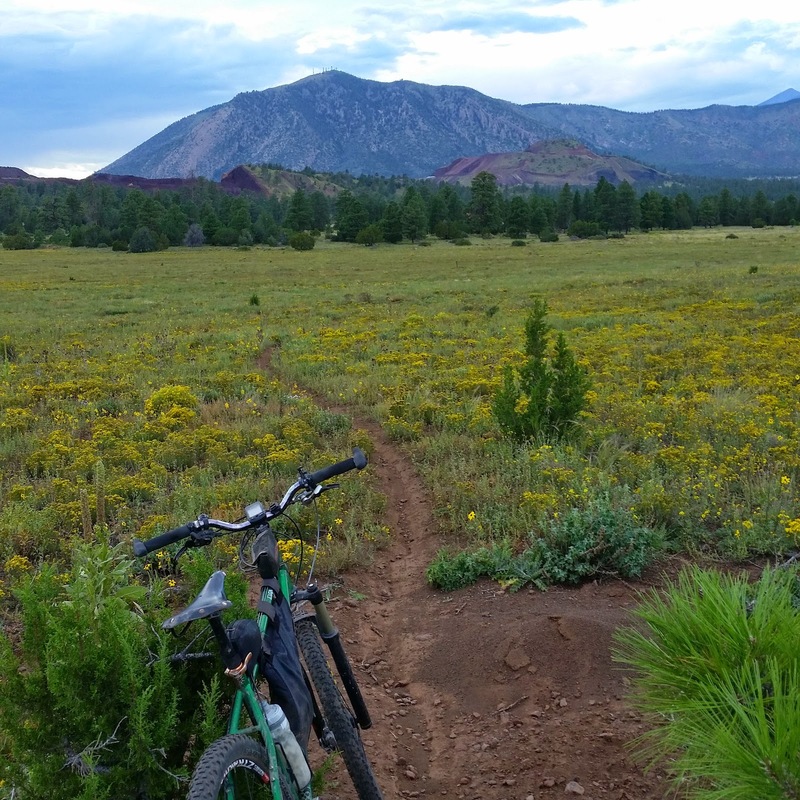 A weekend ride getaway was hatched when K was supposed to be out of town for work and I happened to get an invite to participate in the Arizona Trail Days event at Buffalo Park in Flagstaff. 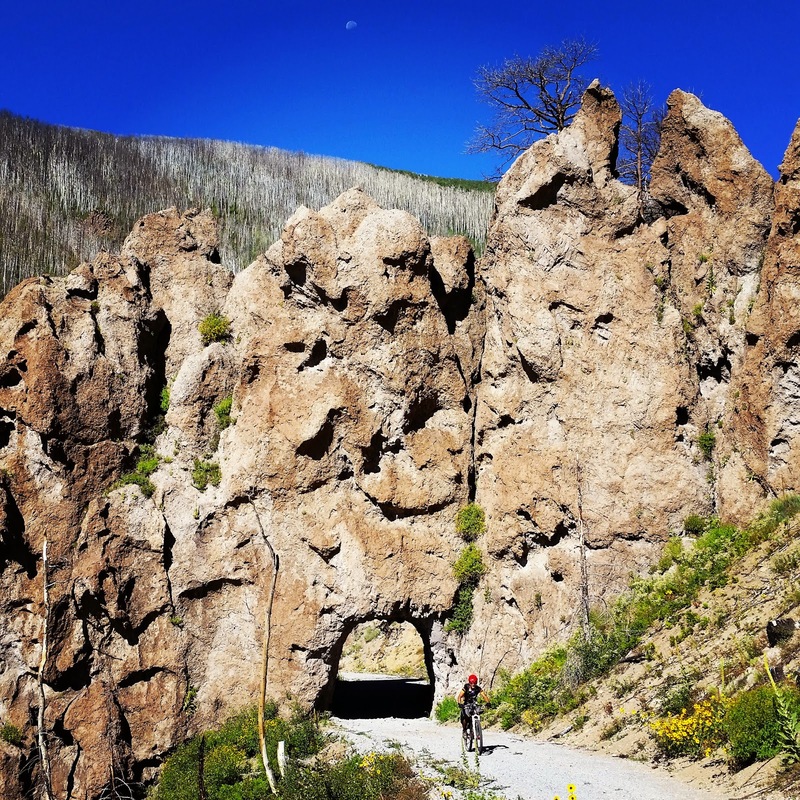 Not a bad gig, hang out for 4 hours talking AZT bikepacking to anyone who had questions. 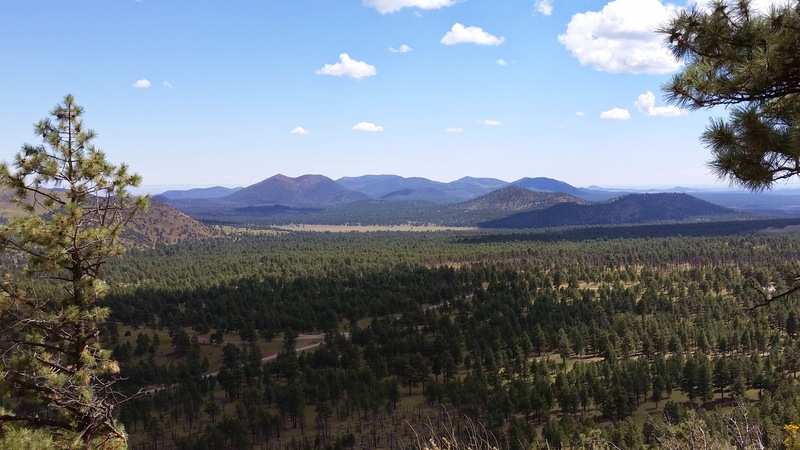 My plan was simple enough, attend the AZT event until 2p, change, hit the trails south of I-40 for a good 30-ish miles then meet Carlos at a TBD campsite. The following day we'd do an Around the Mountain, ATM ride. Saturday morning I arrived early to find a packed Buffalo Park, trail goers and general AZT trail day setup was buzzing. I found out where I was going to be for the day, next to the AZT merchandise table!! I was paired up with Kent, Ripsey wash trail steward, who completed his section hike of the AZT only a few months ago. Way to go Kent!! Our table for the day, right behind the huge AZT banner. Right from the get-go we had people inquiring about the trail, mostly hikers to begin with. 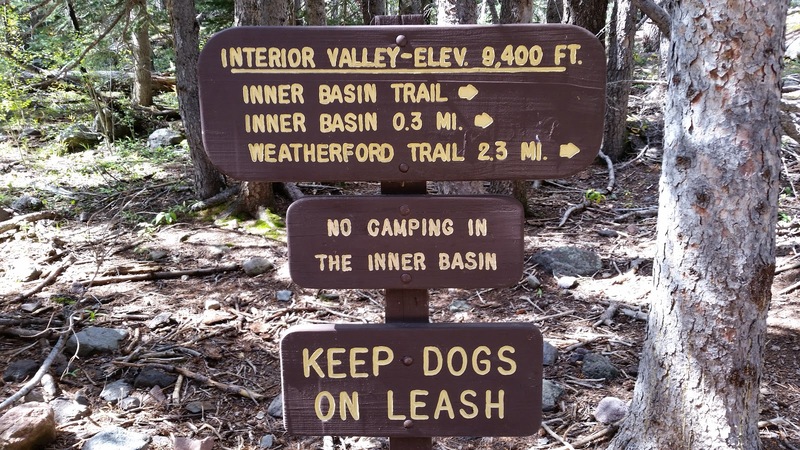 The popular question of the day: 'How long does it take to thru hike the trail?' On average, 2 - 2 1/2 months. That's a serious commitment!! I had my bike next to our table, loaded down with all my bikepacking gear. I also spread out some of my camping gear, the mini stove gathered the most attention. 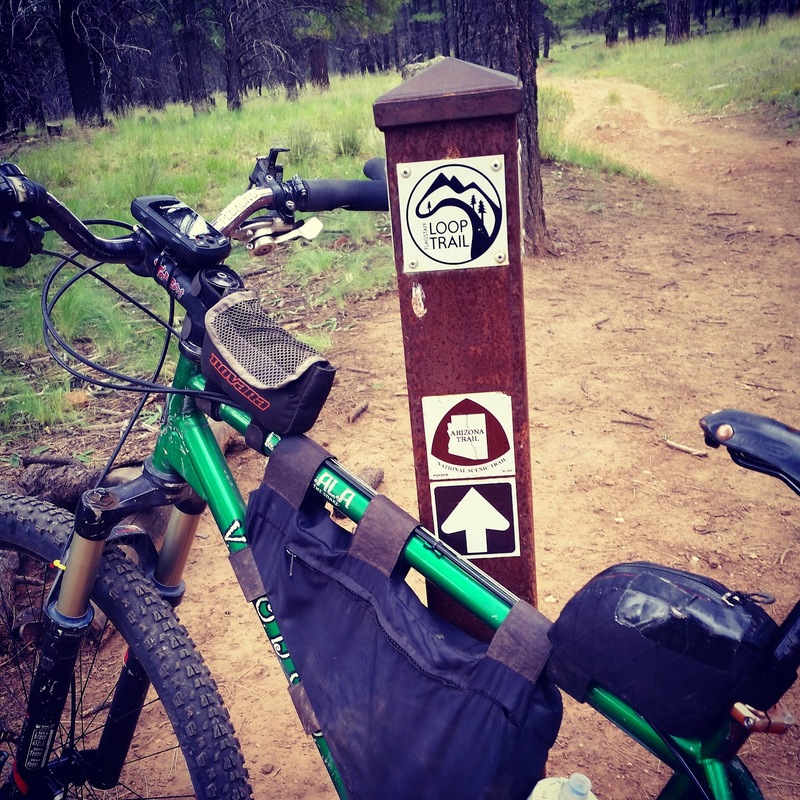 Hopefully I provided enough stoke for a few people to get out there and bikepack the AZT. The event ended at 2p, I changed and was rolling out of Buffalo Park by 2:30p hoping to knock out at least a 30 mile ride before dark. 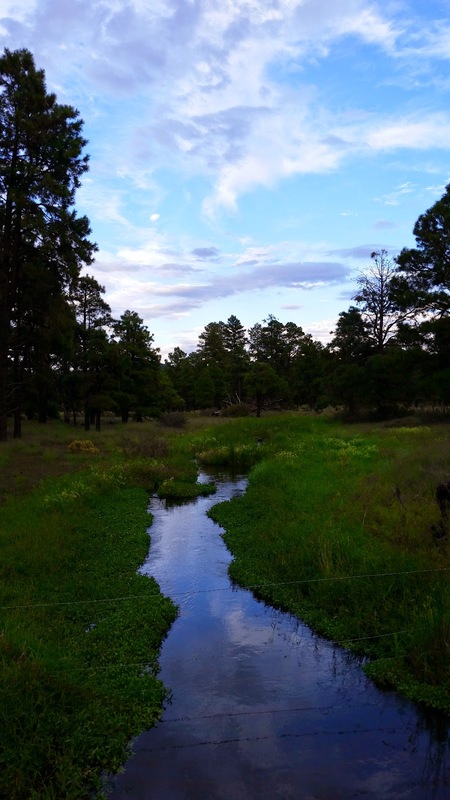 The AZT runs directly through the park, so I followed it south through the Rio de Flag area and into the surrounding forest. I had been on this section of trail many times, so today I was looking for something new. 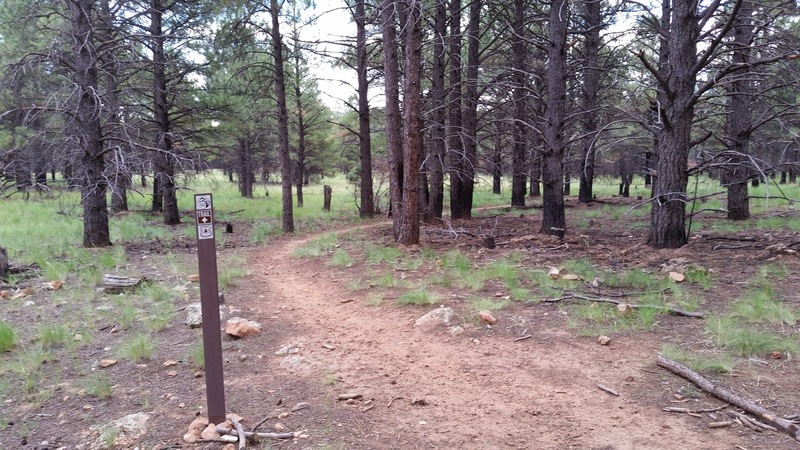 Enter the Flagstaff Loop Trail or FLT. Leaving the AZT for the FLT. About 5 miles into the ride I came to the signed junction of the FLT. I hung a left and motored on. And motor on I did, fast, fast singletrack awaited. I kept waiting for some chunk to appear, but nothing. The miles were flying by as I made my way over to the Campbell Mesa trails. Typical of the FLT for the first 10 miles I rode. It then transitions to double track for a bit just before Campbell Mesa. I took a little detour off the Loop Trail to explore Campbell Mesa. 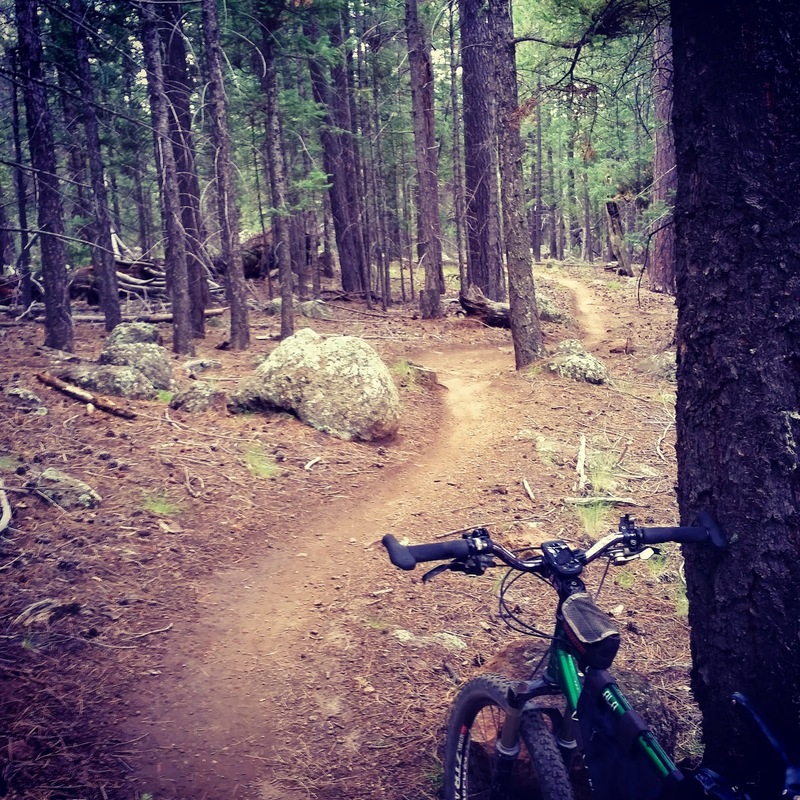 I did the outer loop, then another small loop in the NE corner before repeating a small section to hit another trail. This system is blazing fast too, a nice compliment to the Loop Trail. 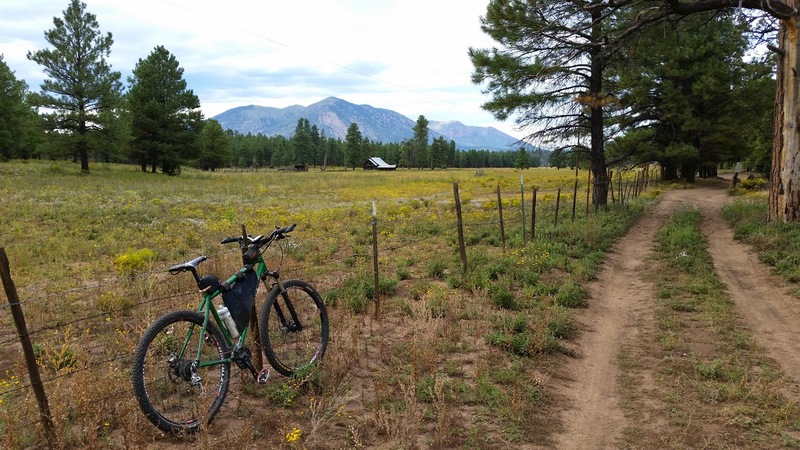 I was making really good time and decided instead of taking the AZT back towards Fisher Point and town, I'd continue on the Loop Trail and return to Buffalo Park from a different direction. 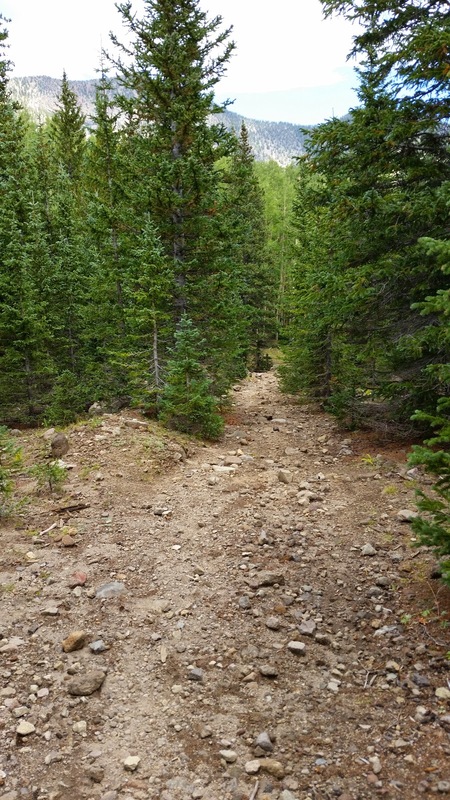 Plus, going this way I'd get to sample some more trails I haven't been to. Miles & miles of this!! 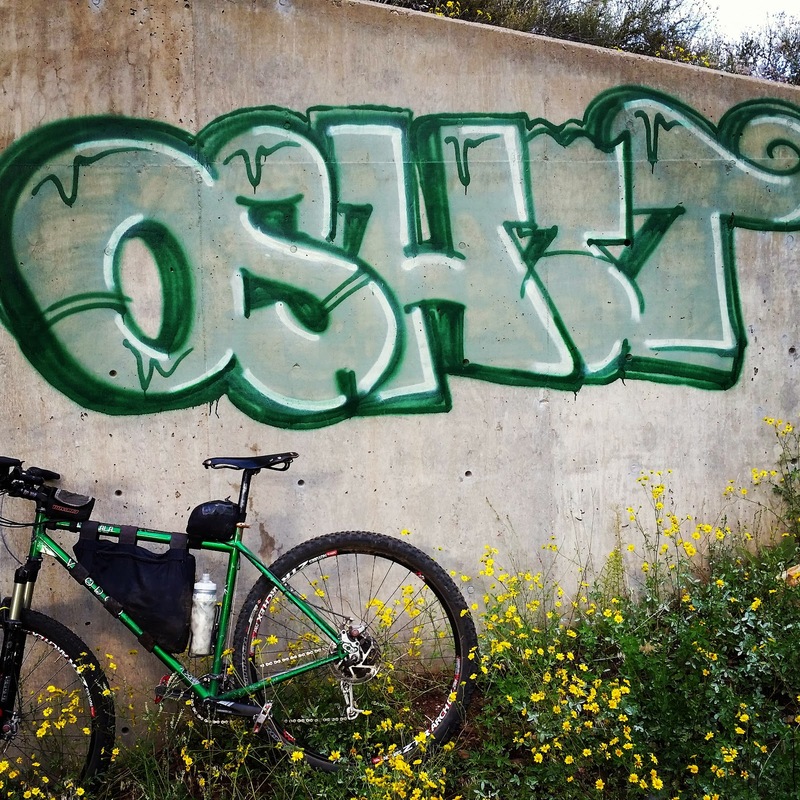 Shortly after rejoining the loop trail, it crossed under I-40, then a short bit of pavement over the railroad tracks where it met up with the bypass loop of the AZT. I've done this section a few times, but never in this direction. I-40 underpass. I thought this was funny since I'd be racing daylight, but I did have my lights. AZT bypass loop heading towards Mt. Elden. I started the slow grind up towards US89. Nothing steep, just soft ground making the pedals spin slower. I crossed under the highway and continued to climb Sandy Seep. There was a decent amount of erosion damage caused by recent storms making things a bit more difficult. 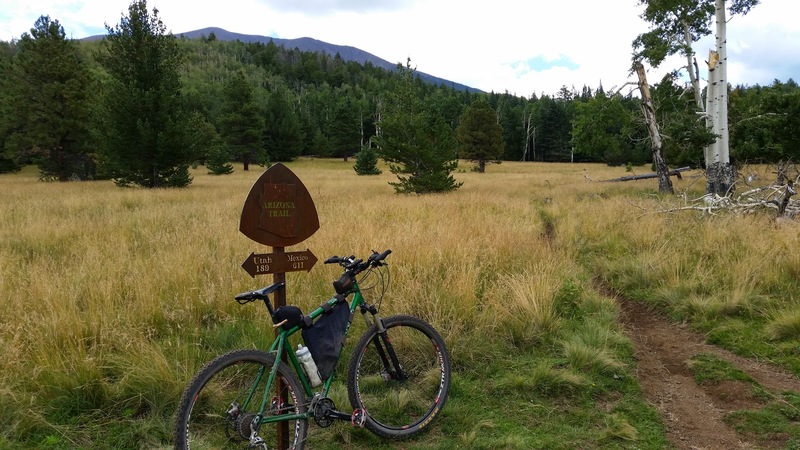 I was happy to reach the split where the AZT went right and the Loop Trail went left. New trail time! 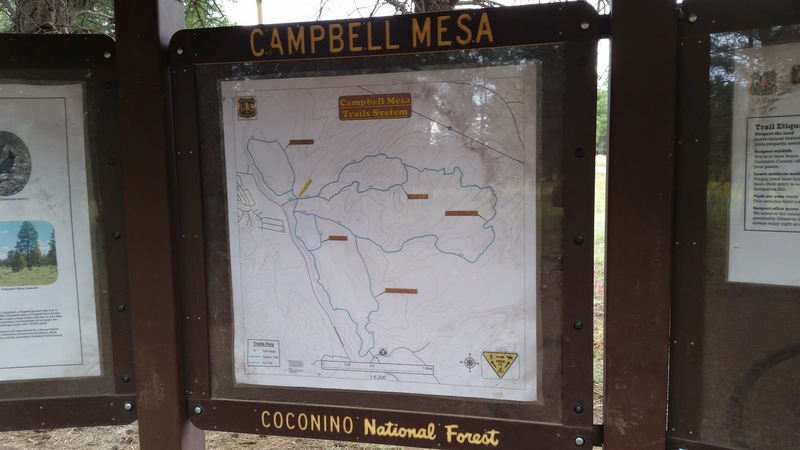 Ever since I left Campbell Mesa I had been following the Loop Trail visually. I made my way across the Christmas Tree trail when the route forked. 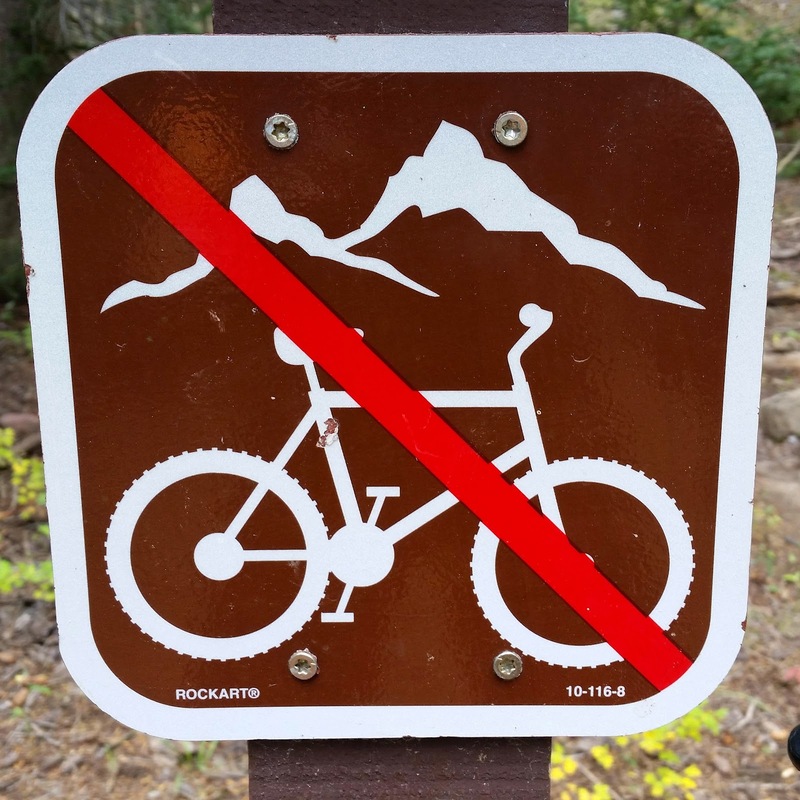 No Loop Trail blaze on either sign, but the one to the left did have 'trail' on it as well as 'TH'. I didn't want to end up at a dead-end trailhead so I veered right, staying higher on the mountain. Looking back, I'm pretty sure this is where I departed from the Loop Trail. I now found myself on Fat Man's Loop, a short HAB later I think I ended up on Forces of Nature, but I could be mistaken. Either way, the trail was a hoot. Generally twisting in a downhill direction dodging large boulders reminiscent of the Hobbit Forest on Elden. 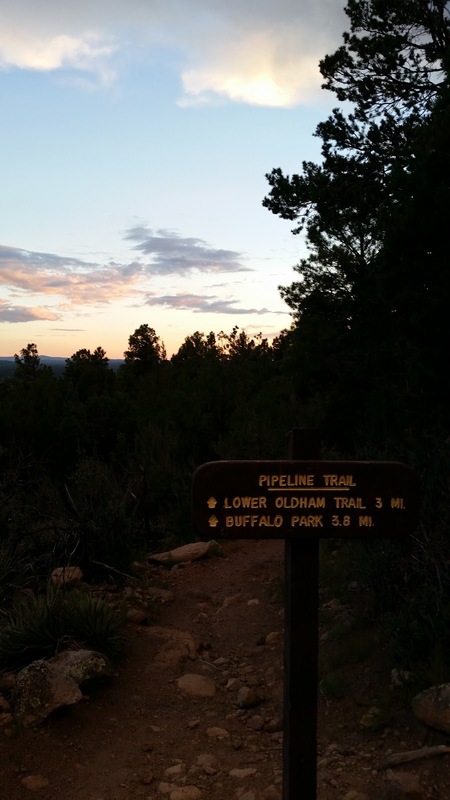 I dumped onto Pipeline and for a moment thought I'd make it back to Buffalo Park without the need for lights. Just under 4 miles to go in the waning daylight. Not so fast. To my surprise Pipeline kind of ended, at least the fast section under the powerlines. 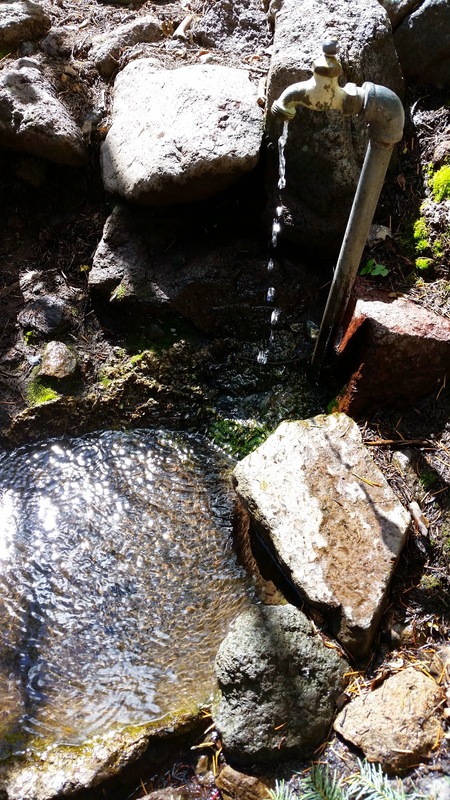 As I dove back into the forest my thoughts turned to putting on my light. I must've dumped onto a side trail initially, because it became tough to follow and had some overgrowth mixed in with short HAB's. I soon popped out onto the 'real' trail and before long crossed another major intersection when I decided to check the GPS to see where exactly Buffalo Park resided. Oops. Overshot it by a little bit!! I was a bit higher on the mountain than I thought. A hiker came down the trail and was giving me directions involving multiple trails when I realized I was at the AZT junction. I knew the AZT ran straight into Buffalo Park, so I was good to go. Twenty minutes later I was back at my car texting Carlos for the camp location for the evening. Turned out to be a mighty fine loop. Carlos found a nice spot just off Shultz Creek rd, practically on course for the following days ride. Carlos and I were in no particular hurry to get going on Sunday. It may have been 8:30a by the time we were rolling out of camp. The rollout didn't last long until our first trail, a mere feet away from the Dog Food trail. 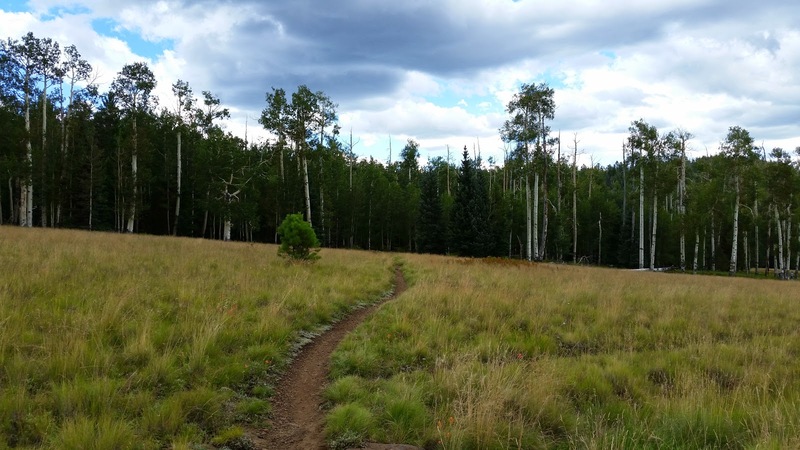 It's not my most favorite trail, but it was a direct shot to the AZT, so we took it. 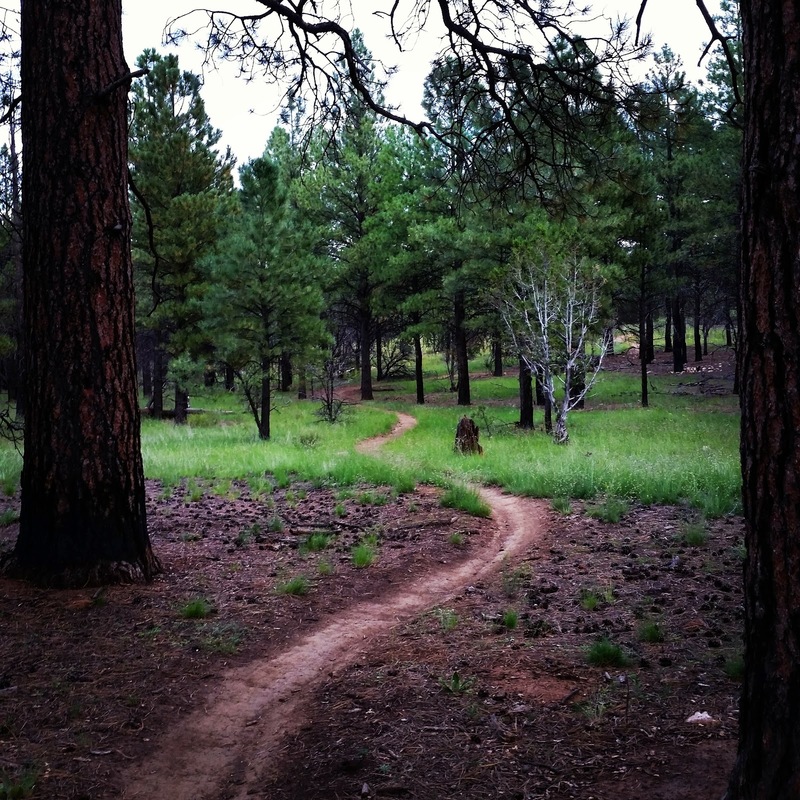 Up on the AZT we were quickly reminded how good the singletrack is leading towards the Sunset TH. Before reaching Sunset we intercepted Shultz Pass rd and made a quick connection to Waterline.rd. The next 9 miles were steadily uphill, but as I mentioned to Carlos, you hardly notice. Just keep pedaling...and enjoy the views. The countless burned trees are a constant reminder of the recent wildfire here. A very cool feature on the climb, lava fin tunnel. While we passed mile after mile of burned forest on the mountainside, we also noted how well the aspens were taking hold. The saplings, now a few years old, will be mighty impressive in a few short years. Behold the cycle of Nature. 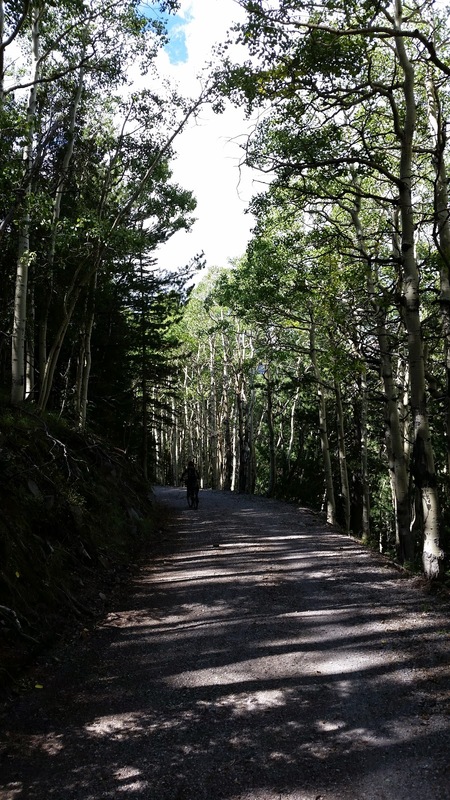 About 7 miles into the climb we re-entered the aspen laden forest. I noted on the GPS how we were getting close to our turnoff onto the Inner Basin trail, aka Pickup Sticks. 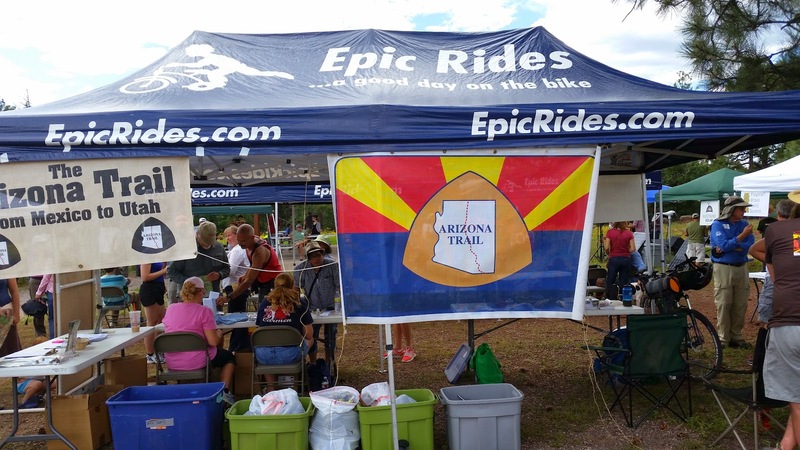 Just as we were getting set to dive-bomb down the trail, a rider came up from behind us asking if our jerseys read 'Arizona Endurance Series'? Yes they do!! 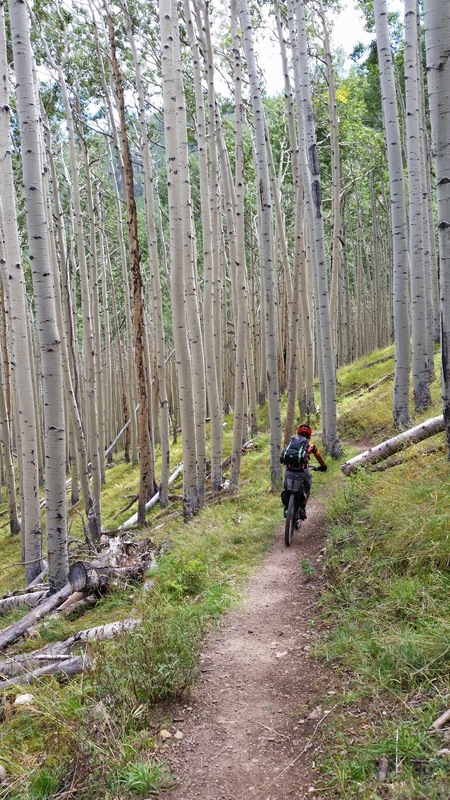 One of the Flagstaff locals, Micha, was also doing an ATM ride. 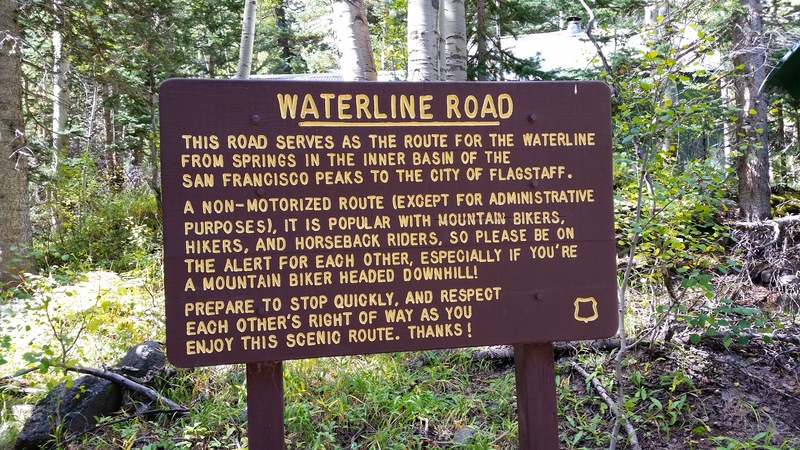 He was kind enough to give us more information on proceeding higher up the trail before committing to the downhill. We took his advice and continued on Waterline rd for another 1/2 mile or so to a 4-way intersection. 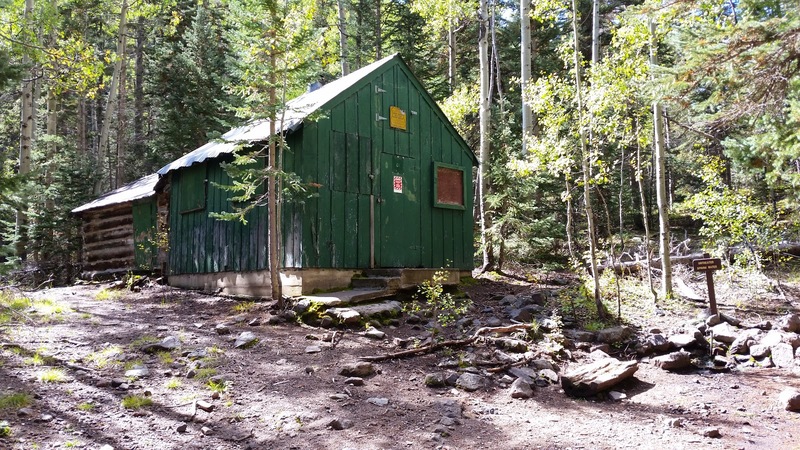 There we found a couple green cabins and an active spring! The 3 C's: Cold, Clear & Clean!! Up to the Wilderness boundary we go. Immediately after the 4-way the road kicks up to a not-so-friendly grade. I dropped into granny gear and still had to stop a couple of times to gather myself while Carlos powered on. 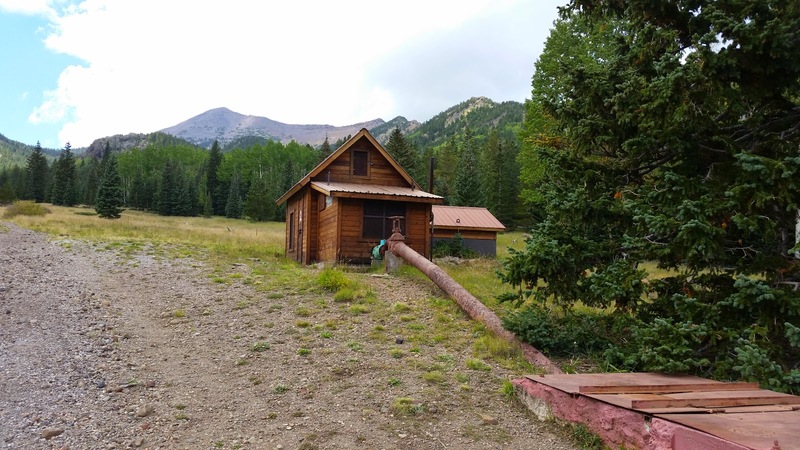 We passed a couple of pump houses as the altimeter climbed past 9700'. 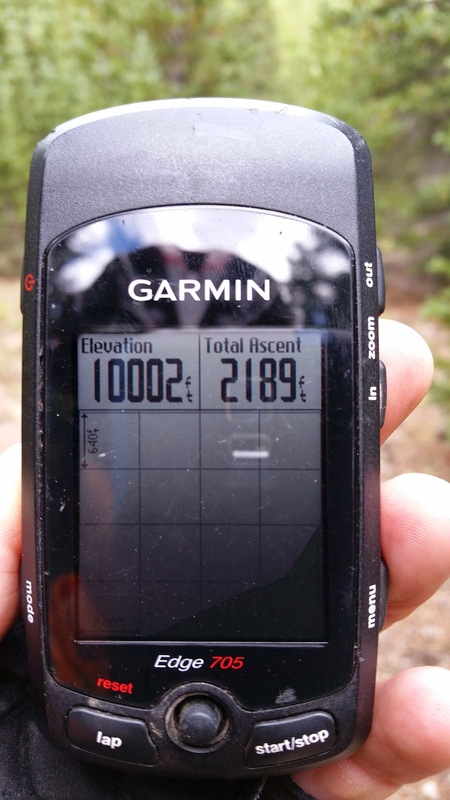 I was really hoping to reach 10,000' via bike. Almost looked like a bus stop of sorts. I was happy to pass 9500' as that was my previous high elevation mark back on the Colorado Trail. 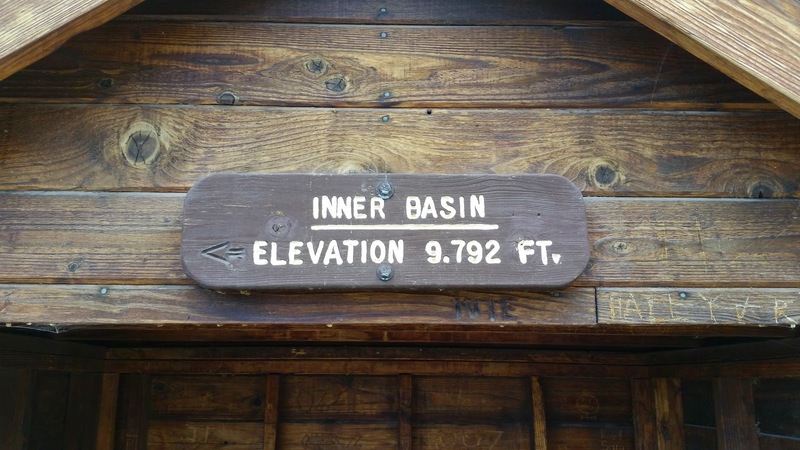 I watched the feet tick by 9800', 9900', then I saw Carlos at the sign. 9950', 9960', 9970'....and finally 9975'!! Really?!?! 25' vertical feet short of 10k. Drat. We left our bikes and hiked up to 10k for good measure. Note the increase in grade%!! At least we topped 10k one way or another. The view from 10k, bikes are practically visible at the bottom. Time to use gravity to our advantage!! It didn't take long to return to the spring. I topped off my supply and we headed for singletrack. Carlos taking his maiden voyage down Pickup Sticks. 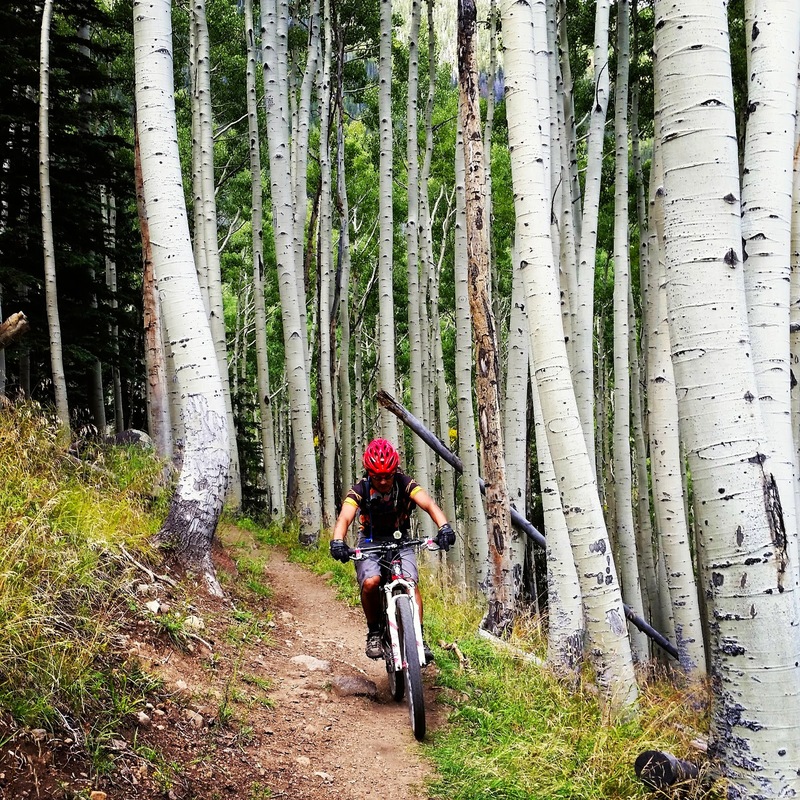 It's easy to see why this trail is popular. Too bad it's only 1 1/2 miles long. 2000' later we were down here. We were back on forest roads for the foreseeable future. The first one FR552 was almost all downhill on a brake pad smoking grade. 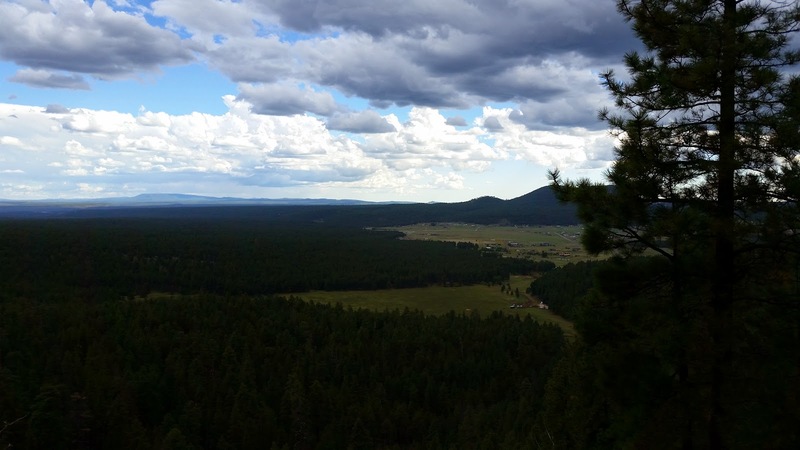 We would then turn onto FR418 for a bunch of miles, including two tiresome climbs, all the way to the AZT crossing. 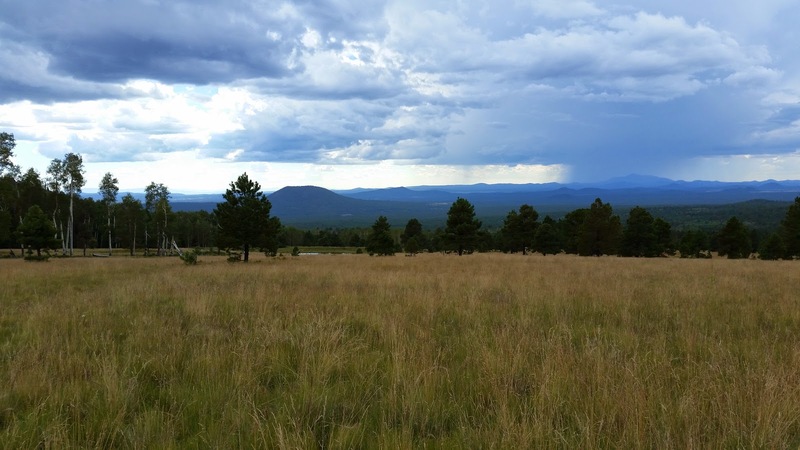 Looking towards the North Rim of the Grand Canyon from FR552. 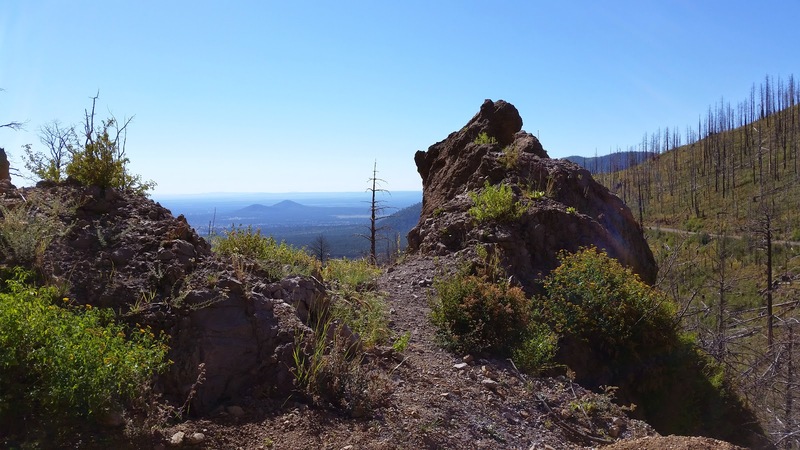 Nice view of Sunset Crater. The first climb on FR418 was a real slog for me. 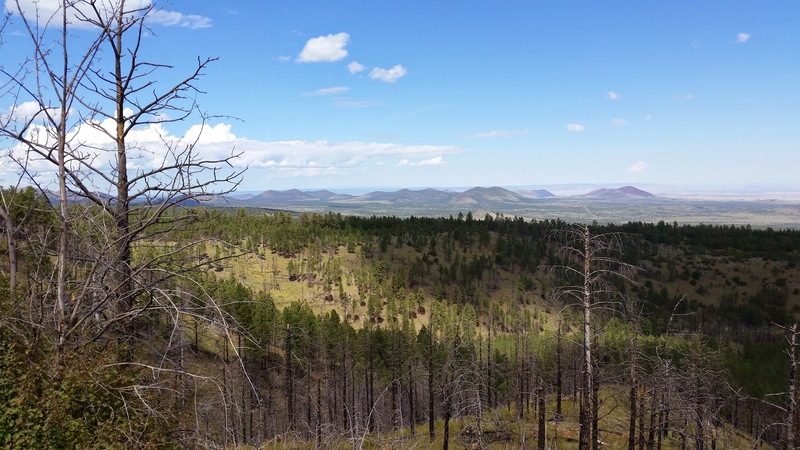 I was getting hungry and wasn't sure it would be a good idea to push through the next climb enroute to the AZT. Carlos was no longer in sight as he dropped me rather easily. He was waiting before the second climb and I convinced him to break for lunch a bit early. It was much needed and a good move as I was able to keep a better pace on the second climb. 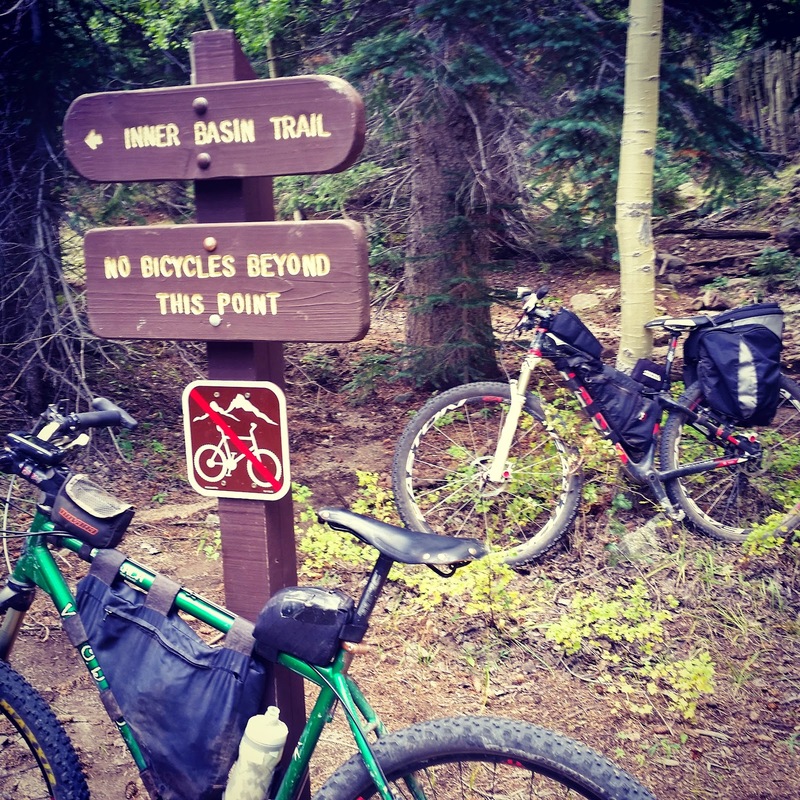 Down at the AZT we ran into a few more riders doing an out-n-back from Aspen Corner. 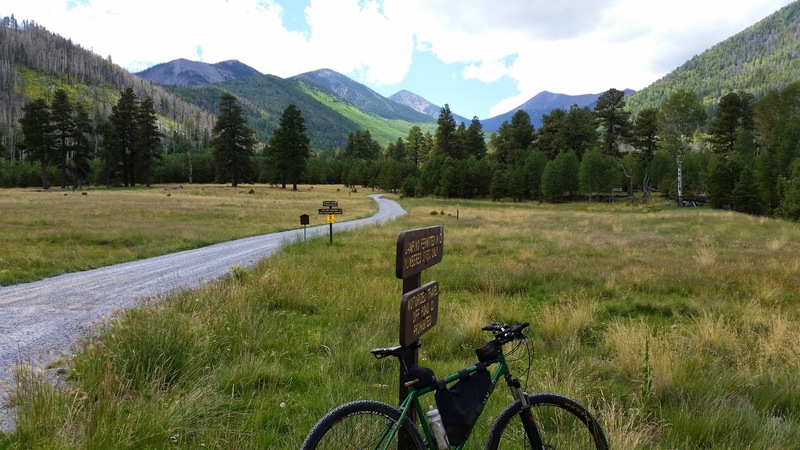 We continued on starting up the 4 mile gentle grade of the AZT towards Bismarck Lake. 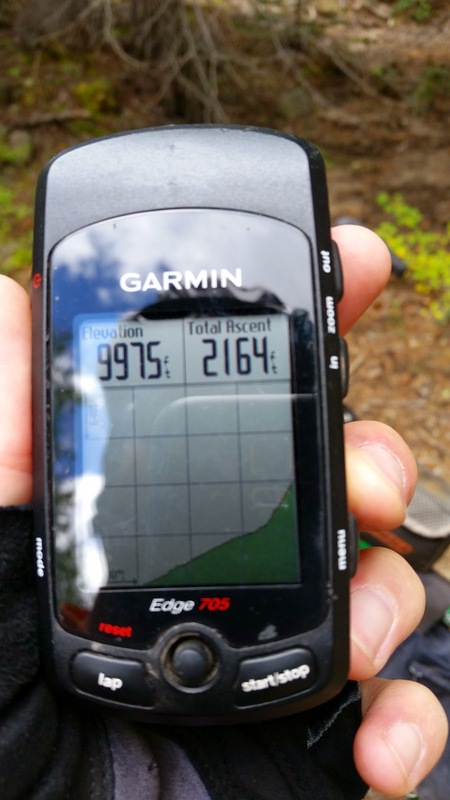 Yep, that kind of climbing. Bismarck Lake junction, which way to go? Both look good. Alfa Fia tank and a roaming shower. The day started clear, but sprinkles were falling and an occasional rumble was heard. 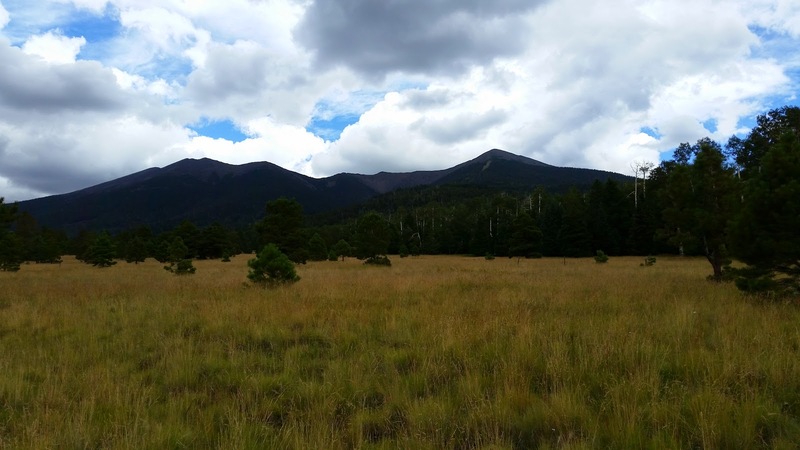 Humphrey's Peak & AZ Snowbowl peaking out. Approaching Aspen Corner and the long downhill. Carlos was riding strong and I knew I wouldn't see him for long when we started down the mountain. I was right, only briefly catching a glimpse of him during the one short uphill section. I did stop for a few pics though!! Mostly rippin' trail like this, some chunk thrown in for good measure too. An often bypassed overlook a couple miles from the bottom. 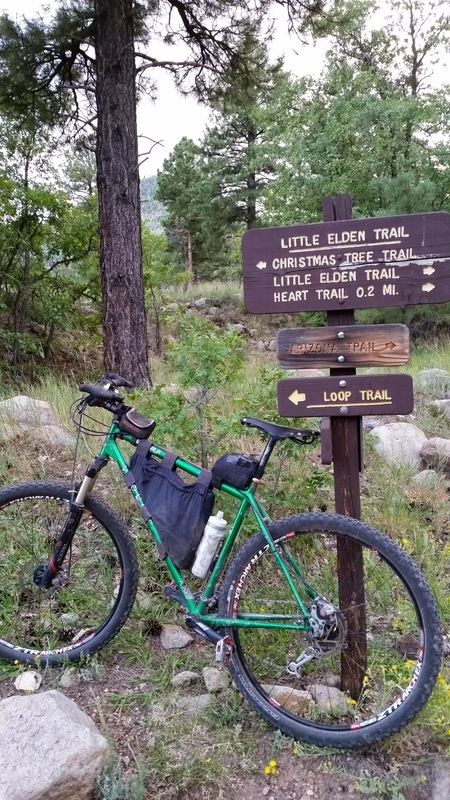 We completed the loop on the flat-ish AZT leading towards Mt. Elden, peeled off on a fun series of trails connecting to lower Shultz Creek before backtracking a bit up Shultz Pass rd to our vehicles. This ride is always on my list as a 'must do' at least once a year. I'm sure glad I was able to squeeze it in before other ride plans take over. It was cool to share the route with Carlos too, he was diggin' it the entire way - most of it being new terrain for him. 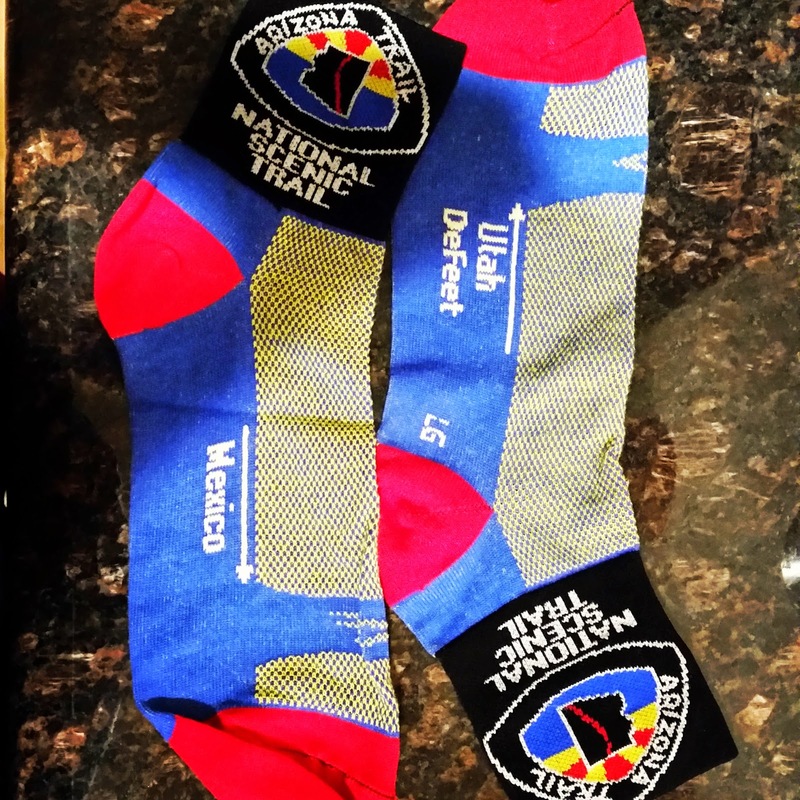 Some AZT swag from the Trail Day event. Driving home, sunset over Mingus Mtn.